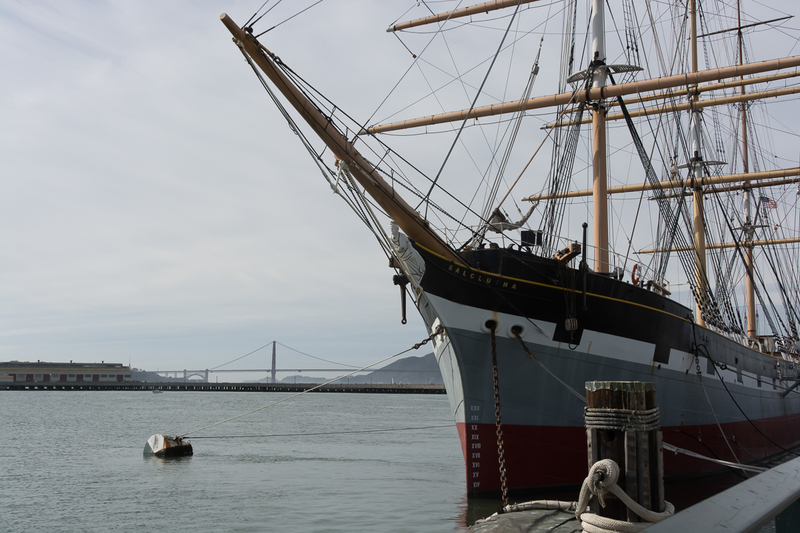 The rigging in Stacy Fischer’s photo of Balclutha, a full-rigged ship built in 1886 now in San Francisco, was quite a challenge to mask so that I could put in a different backgrround. Created for Stacy Fischer’s One Photo Focus, September 2016. I made an animated gif showing 3 versions: The original ship, one with no ice, and then one with ice. Wow. Is that ok? Just “wow” as a comment? This is amazing with the shafts of sunlight and the ice floes. Just seeing the image without the ice makes me really appreciate your artistry in being able to get rid of the building and bridge. This was my favourite of all the entries for September. I was attempting something like this for my own entry but couldn’t find a suitable background and my reach exceeded my photoshop skills. Thanks you Khurt. That is high praise. I had a look at some of your work. You are very talented. I had to pick my jaw up off the floor. I love this edit. It flows and doesn’t look like an edit. It looks like something you would see in a book or on a poster for a movie. Great editing skills! You make me blush. Thank you so much. Maybe, but it is such a true statement! Mad talent! Love the drama of your icy image! 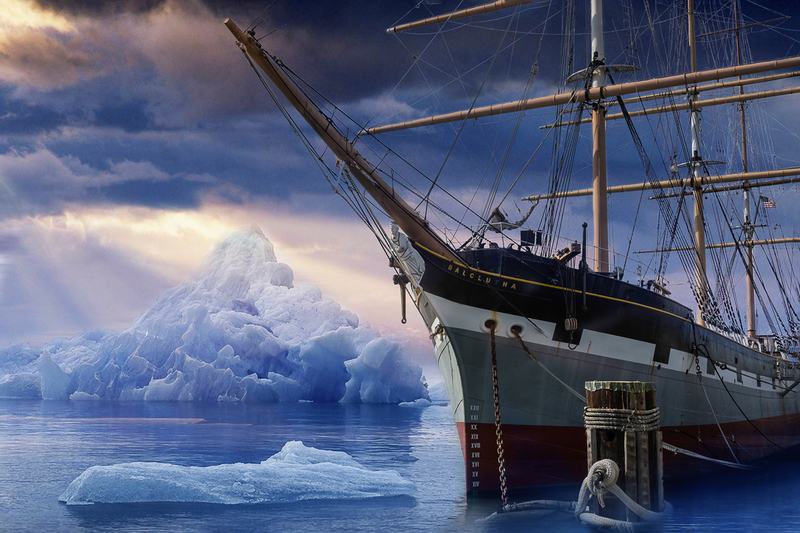 Stunning work with the replacement of the background – the ice and sky look dramatic and the image really powerful. I love this! Very well done! Definitely a challenge. 🙂 I like the second, intermediate image best. Oh well! My choice was the more dramatic one with the ice. I’m amazed that we both posted on the Balclutha. And I like your photo a lot, Sherry. The Balclutha spent many years making trips to Alaska for salmon charters, so your large ice mounds are completely appropriate. She’s a fine ship. So cool. Paths cross. I didn’t know the Balclutha had been around ice. It just felt right to me. That is impressive, Sherry! Well done! I had to paint back a few lost lines in the mask – felt like I was building a ship :-). Love it, Sherry. Beautiful and very creative. But is this posted a week early? Or am I just late? I thought 1PF was the first Friday of the month. Thanks so much. We are required to email the URL of the post before the 30th which is why I posed it a few days before the first. Is there another way to send Stacy the URL before it is posted? Yes, Sherry. On the Edit page, when you have finished your post, in the upper right is a box where you go to post it. The third line down says something like “Publish Immediately” or “Edit”. Hit Edit, put in the date and time, then hit OK and then “Schedule”. You can then copy and paste the short link, or hit “View Post” and copy and paste the link in an email to Stacy. And now that you’re probably totally confused…. I saw the short link which isn’t enough. I’ll try looking for the long URL next time. Thanks. Very dramatic. Looks like a movie set!